Just north of Yichang, deep in a cliff on Xiling Hill, the Three Travellers’ Cave is a popular stop along the Yangtze River. During the Tang Dynasty in the 1st century, this cave was visited by three famous poets. 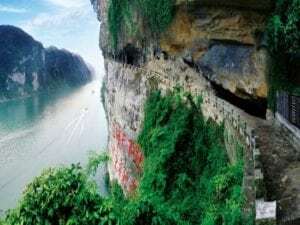 They were so moved by the beauty of the cave, and the view over the pretty Xialiao Stream, which they were inspired to inscribe right on the walls of the cave. During the Song Dynasty, the cave was visited again by a famous Chinese writer and his two sons, and again, they were inspired to create great works of poetry. Today, the Three Traveller’s Cave is famous throughout China, and people come from all over to see the poems, calligraphy and drawings that decorate the stone. Popular spots include the two stalactites which act as pillars, creating a gate to the cave, and the incredible view over the world famous Yangtze River.